Just over 80% of us have experienced career drift in our professional lives according to a survey undertaken by Course Library. 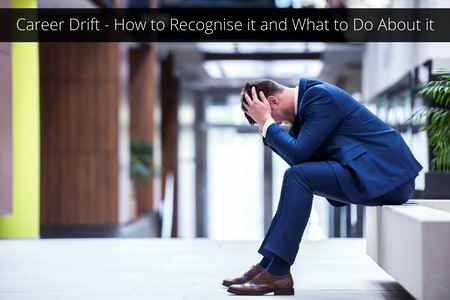 It would seem therefore that drifting is almost an inevitable part of the career progression and worth preparing for. Half of the 1,200 respondents felt that leaving their current role when faced with a career slump was the best option, so we’re clearly prepared to take dramatic steps to rectify the problem. A career slump can happen when you have no clear career plan, but equally, when a well thought out career strategy comes up against unexpected problems. You may have had a career plan, but then diverted from it because you were offered a role that didn’t turn out well. Or you had a brilliant plan which was going well and then a company restructure stalls your progression in the organisation. Even the best-laid plans need monitoring and adjusting as curveballs come your way. Recognising the signs early on can help you get back on track quickly to avoid the pitfalls such as boredom and lack of motivation. Respondents to the Course Library survey differed in their approach to drift – apart from the half that would leave a role, just over a quarter (28.2%) felt the best way was to enhance their skill-set through courses and gaining qualifications while others felt a less radical approach was a better bet with 23% of participants speaking with their manager about career progression opportunities and 20% asking for a mentor within their current workplace. If you are experiencing career drift, what can you do? Before you decide to leave and to send your CV to everyone you know, take stock and develop a plan (yes, another one!). Give yourself time to process the resentment, disappointment, or even panic that you may be feeling. Focus on your strengths and value and what you might be able to offer any prospective employer. It is worth thinking both short and long-term while you get back to your original plan. Is the original plan still valid? Do you need to reassess what it is that would give you career satisfaction? Ask yourself difficult questions about what constitutes meaningful work for you and think about whether your goal has changed from when you first started out. Your network may be the best place to start. Look at some LinkedIn profiles of people you admire who have similar goals but be thoughtful about how you ask for help. Approached with a sharing mentality rather than purely asking for advice is more productive in the long run as you will be remembered more favourably. Be courageous, respectful and polite! Over 1 million people on LinkedIn are hired through their connections every year so it is a proven route to success. Finding a solution to a career slump is not always quick and easy, so keeping contacts on-side and ensuring they don’t forget you’re still looking is a challenge. Finding a mutual interest, sharing industry news or joining relevant groups and becoming an active participant will all reap rewards. Don’t forget to keep networking when you have found that dream job so you have a ready-made support network should you find yourself in a similar situation a few years down the line. You don’t necessarily have to leave your job to get your career back on track. Many organisations offer in-house training which could enable you to move within the company or there are now many opportunities for online or part-time courses. Talking to HR or a colleague might also open up opportunities you were unaware of. Can’t find the next step for your career? How about creating it? You can become the designer and builder, the architect of an exciting and satisfying individual career. There is something incredibly empowering about seizing control of your life and creating the job you want, rather than waiting for it to happen or waiting for someone to give it to you. You can start that business you always dreamed of or decide what your dream job would be and sell the idea of employing you to the company you admire. You are no longer a passive job seeker, but someone actively forging a unique career path. If you’re out of a job or stuck in a drifting job, look at your situation as a great opportunity to change your life and do something different. It could be the best thing you’ve ever done. One of the best ways to avoid career drift is not to ignore the warning signs. Always have the ‘what next?’ question at the back of your mind. Hesitating can prove expensive both in your career and financial health. Taking charge of your career now will set you up for the long-term. Good luck!